The September 11, 2001 terrorist attacks brought about many changes in American society. The government established a new department to deal with terrorist threats. Airports instituted tough new security rules. Public awareness of Islam and Muslim countries grew and - in many cases - so did distrust and hate. But one woman whose life was turned upside down on September 11th turned that personal tragedy into healing and hope for women half a world away. Susan Retik Ger doesn't like to remember September 11, 2001. Her husband was on American Airlines Flight 11 when hijackers seized control and flew it into the World Trade Center. "My husband, David, was traveling for work," she says. "I was listening to NPR on the radio and heard about the news of the day. I didn't realize that my husband was on that flight. When I got home, I was able to realize that it was the same flight. It was devastating. I had two very young children. I was pregnant with our third at the time. It was what everybody can imagine, your worst, worst nightmare coming true." But she says, the support she received helped her deal with the pain and loss. "Not just from my friends and my family who were amazing, but from the larger community, strangers, from around the country and even around the world, sent me letters, notes, cards and handmade quilts," she says. "People were cooking us meals and I felt all that support." When American forces went into Afghanistan to pursue Al Qaeda leader Osama Bin Laden and others responsible for the terrorist attacks of 9/11, Retik Ger says she realized one result of this military response would be more widows. "I knew how devastating it was to be a widow with young children," she says. 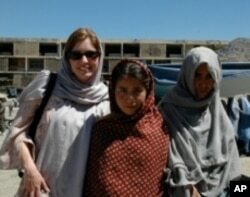 "My initial thought was who is helping those widows in Afghanistan. I began to do some research and learned that, for example, under Taliban, women were not allowed to go to work, women were not allowed to go to school. I learned that when a husband is killed or dies, the woman doesn't get that husband's property so, often times, she finds herself homeless. I didn't experience any of this." She tried to think of ways to help Afghani women. "My initial idea was to reach out to one woman and her family, she explains. "So many people reached out to help me. Then, I realized that the amount of money could help more than just one family. It snowballed and Beyond the 11th came to be." In 2003, Retik Ger cofounded Beyond the 11th with Patti Quigley, who also lost her husband in the 9/11 attacks. "It's to raise money, and it's to raise awareness for the plight of the widows in Afghanistan," she says. Over the last seven years, Beyond the 11th has given about $600,000 in grants to support income-generating programs for those women. Retik Ger's passion inspired her 12-year-old son. He and a group of his friends founded an organization after the earthquake in Haiti. It's called Soccer for the Next Generation. Susan Retik Ger receives the 2010 Presidential Citizens Medal, the nation's second highest civilian award, from President Barack Obama. "They decided that they wanted to send new and used soccer balls to the kids in Haiti," she says. "So one of the programs that 'Beyond the 11th' had made a grant to Afghanistan was for women to hand sew soccer balls in their homes. So the money my son raises is going to purchase handmade soccor balls made by widows in Afghanistan." Susan Retik Ger's work caught the attention of the White House, and last month, she was one of 13 recipients of the 2010 Presidential Citizens Medal, the nation's second highest civilian award. She was honored for advancing women's rights and demonstrating the power of America's ideas. 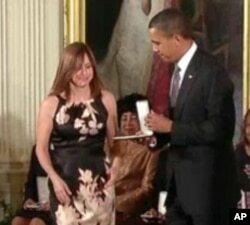 Presenting the medal at a White House ceremony, President Barack Obama said, "Nobody would have blamed Susan if she had turned inward with grief or with anger, but that isn't who she is." Retik Ger agrees, it's not. "I didn't want the terrorists to win and just the world to remember 9/11 about hatred," she says. "Why not make 9/11 about giving something good for your fellow human beings."